Safety games can help reinforce safety rules without seeming overwhelming. Whether trying to train employees about workplace safety or training children about fire safety, there are many different games both online and off. United States Department of Agriculture - The USDA features several different games to help you learn about food safety. There is even an interactive educational website that helps you learn to fight against bacteria. Also, offers teaching material for teachers and parents. ABC Safety Training - Offers different types of games for workplace safety training as well as videos. Some of the games include topics such as accident investigation, eye care and safety, personal protective equipment and workplace violence. 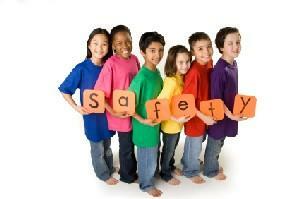 Fire safety games can cover topics such as escaping a fire in a building or fireworks safety. You will even find games involving campfire and forest fire prevention. Here are a few games to play that revolve around fire safety. Elmo's Fire Safety - This site is just for kids and teaches fire safety through an interactive game that takes you on Elmo's tour of the fire station. McGruff - The dog that takes a bite out of crime wants to help keep your child safe. Play games about topics such as dealing with a cyberbully, which adults you can trust and Internet safety. National Fire Protection Association - Several online safety games that cover topics such as home hazards or building an emergency supplies kit. National Center for Missing and Exploited Children - In addition to articles and information about Internet safety, you'll find links to games to help children and teens stay smart and safe while using the Internet. Kids.com - Play for points and learn Internet safety at the same time. This site is aimed at younger kids, but parents can play along and learn how to keep their child safe. Gamequarium - Links to many different sites with games promoting online safety. Whether you purchase a game to play in person and learn more about safety, or choose to surf the games online, you're certain to learn many useful new tips that will be better retained by playing safety games.